Enter the GreatCall Urgent Care App! Perfect for moms like me, the GreatCall Urgent Care app gives you access to doctors and nurses 24 hours a day, seven days a week! You can use the symptom checker, you can check out the medical dictionary, and if that is not enough, you can talk to a nurse live! If the nurse can't help you, you'll be connected to a board-certified doctor who can give you advice as well! I can think of about a hundred different times this app would have come in handy for us! Hmmm, does anyone remember just a little less than a month ago when we had to drive in the dark in a town we didn't know in the middle of the night to take Bean to the ER in Pigeon Forge after he bloodied his nose in the play land? Wouldn't it have been so much easier to have just called a nurse and had them tell me that nothing was wrong!? Sigh. Yes. But instead, we sat in the hospital for three hours to have them tell me nothing was wrong! I seriously think this is a great app, and I am very happy to have it as an option when something goes wrong, as it often does in my household! I know that we're all busy, we're all constantly juggling, and this app is just a little extra peace of mind that if something goes wrong, you can get it taken care of super fast! 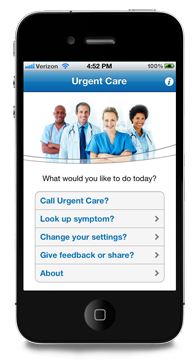 Download The GreatCall Urgent Care App for Google Play or iTunes today! It's free! The fine folks behind the GreatCall Urgent Care App are giving one lucky Flip Out Mama reader a $25 iTunes or Google Play gift card to use towards medical calls, or anything else that strikes your fancy! Enter below on the Rafflecopter to win, and good luck! I would like to get music !